Although a bit pricy, Tuscany Calgary offers great value in a low-crime, northwest Calgary neighbourhood. Tuscany Calgary has been described as a perfect, quiet location with lots of green space, trails, the Calgary Tuscany off-leash park, rec centre and trees. It offers good access to Stoney Trail, the Trans-Canada Highway and Crowchild Trail as well. A large shopping complex just east on Crowchild gives these people convenient access to everything they should need, including the Crowfoot C-Train station. There are also several routes to downtown, smaller local shopping areas and an unobstructed view to the west that gives folks a panoramic view of the mountains or Canada Olympic Park as well. What else does this highly desirable community have for its people? Natural ravines, potential for growth into classy, mature beautiful parks, with walking trails already in place. Why do people find this such a fantastic location? It's clean. It's modern and sought after because of that. Also, the Tuscany Club Calgary lets the homeowners gather together to celebrate their pride. Who is Tuscany for? Young families, for starters. Streets are child-friendly, low traffic and safe; there is lots of space to run and play; schools are becoming more widely available. The neighbourhood offers a variety of great houses and Tuscany town homes in Calgary. There is even talk of a future LRT station in the area. There's quick access to the ski hills at Canmore (and beyond), the beautiful Lynx Ridge Golf Course and the main Bow River Pathway system as well. Tuscany is surrounded by Stoney Trail to the east, Bearspaw Dam Road to the south, Twelve Mile Coulee Road on the west and Crowchild Trail to the north. Just look for the number 22 on the map right here. 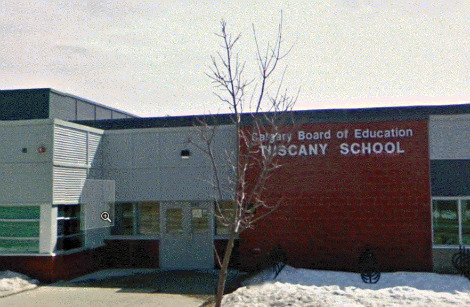 It has these schools for the children: Tuscany elementary school for kindergarten to grade 4, 5's and 6's go to Marlon Carson School, 7-9's to F.E. Osborne School and the older ones to Bowness High School. In the Calgary Catholic School District, we have St. Basil for K to 9, Madeline d'Houet for 7 to 9, St. Luke and St. Sylvester for K to 6, Msgr. E. L. Doyle takes K to 6, Our Lady of the Assumption school takes K to 9, St. Francis High for 10 to 12. Quite a choice. Pride. Prestige. The Tuscany Gardens Calgary. Residents enjoy the privacy their neighbourhood offers. With that strong Tuscan feel in the community, people are rarely disappointed with Tuscany. Go back from Tuscany Calgary to the Calgary Real Estate webpage.